Sometimes it is difficult to remain composed when the situation is very stressful or overwhelming. For some people it is easier to remain calm and composed even when others might find themselves cracking. 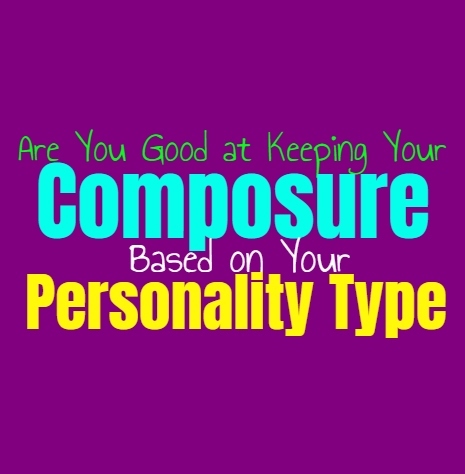 Here is how good you are keeping your composure, based on your personality type. INFJs are often good at appearing composed in most situations, even if inside they are feeling a bit stressed. They keep a lot of their feelings inside and try to remain calm on the outside. Most of the time INFJs are capable of remaining composed and poised when they need to. There are times when they are a bit stressed or anxious about something, and so they might lose that composed appearance in these situations. It isn’t something that happens often, since INFJs do their best to remain in control. ENFJs are often composed people when they need to be, and will do their best to remain in control. They don’t like allowing their emotions to get in the way, and want to be able to focus on what is important to them. While ENFJs might do their best to remain composed most of the time, there are moments when they might not be able to keep their feelings to themselves. When the ENFJ is truly passionate or worked up about something they are much more likely to lose that natural composure which they possess. INFPs are not always the most composed people, simply because they wear their heart on their sleeve. They don’t find it natural to pretend like they are feeling a certain way in order to remain calm and composed. INFPs go after what feels right for them and they want to live with passion and excitement. For them it isn’t important to feel poised when they should be more expressive and open about how they are feeling in any given situation. They would rather stay true to themselves, no matter what this means. ENFPs aren’t usually the more composed people, instead they are expressive and passionate. They follow their hearts and don’t find it natural to hold back just so they can appear poised and composed. For the ENFP composure is not nearly as vital as remaining true to themselves and what they believe in. They also want to live their lives with a sense of inspiration and excitement and so for them always seeming composed isn’t really that valuable. INTJs are often good at keeping their composure, even when they are feeling stressed. They don’t outwardly show their emotions to most people and find it easier to keep things to themselves. While the INTJ might be internally stressed about something, they will remain composed and in control around others. They want to focus on solving the problem instead of allowing their emotions to get the best of them and take control of the situation. ENTJs are often composed when they need to be, especially when they are focused on getting something done. They believe in being efficient and so they don’t want their emotions to get in the way or prevent them from finishing the job. For the ENTJ it is important to remain in control and so they do believe that composure is truly important. ENTJs do have some moments where they can become worked up though, especially if someone around them is being completely inefficient or are standing in the ENTJ ways. They focus on getting things done and don’t like stress to cause them to behave the wrong way. INTPs often appear more composed than they actually are, simply because it isn’t natural for them to express things outwardly. They might be feeling panicked but most of the time people don’t see them when they are feeling this way. They keep themselves appearing calm, simply because they are so inside of their own minds when they are actually stressed. INTPs might appear composed but in truth they do have a tendency to analyze things to a point where they are actually very stressed. ENTPs aren’t always the most composed people, simply because they don’t always want to be. When they feel like getting excited about something they don’t want to hold back for the sake of appearing a certain way in front of others. They are capable of maintaining their composure when they want to, but ENTPs sometimes enjoy shaking things up and showing that they are excited or passionate about something. ISTJs are excellent at remaining composed and in control of their emotions. They don’t like feeling like they have lost a sense of control in their lives and so being composed is important to them. ISTJs want to be able to focus on getting things done without allowing feelings to stop them from being efficient. People who are incapable of remaining poised and composed can be a bit annoying for them ISTJ, and they might see this as a weakness. For the ESTJ being composed is very important, since they want to remain in control of their own actions at all times. When they are feeling overwhelmed they simply try to overcome this and remain focused on the task at hand. For ESTJ losing this composure can be a sign of weakness, and really isn’t something they are likely to let happen. People who are incapable of remaining composed and simply allow their emotions to take control, seem a bit weak to them and this can be frustrating. ISFJs do believe that composure is important and so they do their best to remain poised and in control. ISFJs are often very focused and composed people, even when they are feeling stressed. They want to be able to focus on getting things done without allowing their feelings to hold them back. While they are empathetic and deeply feeling people, they don’t want their own stress or feelings to prevent them from taking care of their loved ones in any given situation. ESFJs are often good at keeping their composure when the situation is stressful and they need to keep a handle on it. They want to be able to take care of their loved ones and to them it is important to always work hard for this goal. For the ESFJ composure is important in situations where they need to remain in control in order to get something done properly. When the ESFJ is very passionate about something or being protective of someone they love, they do often lose this composure in those moments. ISTPs are capable of remaining composed in certain situations, since they don’t like allowing their emotions to take control. ISTPs can remain calm when the situation calls for it and are often good at keeping their cool. They can definitely be very composed people, but sometimes they don’t really want to appear calm and cool. When the ISTP wants to get excited about something they are willing to abandon this composed nature in order to really experience something with a sense of thrill and passion. ESTPs are passionate people and so they aren’t always great at keeping their composure. They try their best to remain calm in their work setting so that they can be in control of their emotions and remain focused. While they do sometimes have the ability to approach the situation with a composed nature, this isn’t something the ESTP can maintain all of the time. There are situations where they are excited or passionate about something and so their composure can sometimes disappear. ISFPs are passionate people who focus on following their emotions in a situation. They do what feels right without needing to constantly appear a certain way to others. They aren’t always the most composed people, simply because they don’t want to compromise who they are. For the ISFP it is important to remain true to themselves and their values, even if this means they aren’t likely to be seen as composed or in control. ESFPs are passionate people who don’t usually care that much about remaining composed. They are capable of being very poised in the right setting, but this isn’t something ESFPs always want to maintain. They care about following their hearts and remaining true to themselves and their loved ones. When the ESFP is excited about something they want to express this openly, and don’t much care about keeping composed in these situations.